The Arts Castle in Delaware currently is exhibiting quilts that are unique pieces of fabric art created by local artists. 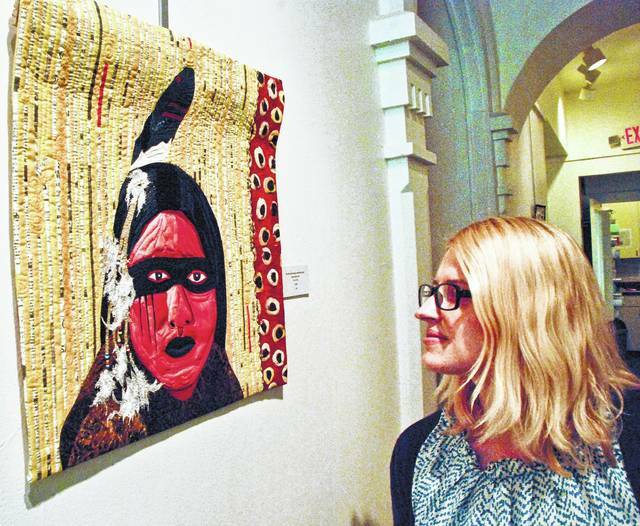 Kati Henning takes a more detailed look at a Native American piece hanging in the hall on the main floor. 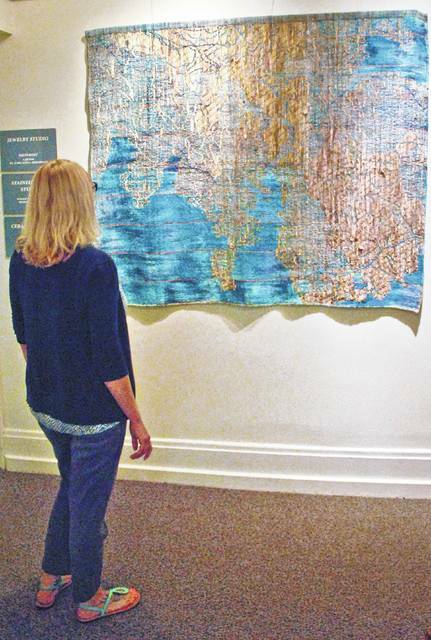 Many of the quilt pieces exhibited at The Arts Castle in Delaware are artistic representations of maps woven into textile art. Kati Henning admires a large map by Liz DeBellis Hughes. The handiwork of two quilters and a weaver is currently on display at The Arts Castle in Delaware. Unique, non-traditional pieces created by local artists Sue E. King, Liz DeBellis Hughes, and Tammy Perakis Wallace will remain in the castle’s galleries until Aug. 4, according to Kati Henning, manager of administration and registration. “Two Quilters & A Weaver, A Contemporary View” is not your grandma’s quilting exhibit. No offense to grandma, of course. King uses fabric as her medium. DeBellis Hughes utilizes a combination of cotton and silk fabrics, cotton yarn as well as chemical and natural dyes. Wallace makes use of cotton fabric, yarn, paper, and recycled clothing for her pieces. While many pieces in the exhibit have caught her attention, Henning said the works of DeBellis Hughes are particularly interesting to her. “She makes large-scale map scenes using a lot of cotton and silk,” Henning said. “They’re really eye catching and when you step back from them, you really can tell that it’s a woven map. I’ve heard that all of those are places that are very special to her as a person, so she’s taken those and turned them into something lasting. I think they’re beautiful. All of the items on display are available for sale, Henning said. A list of pieces by each artist with the cost is available in The Arts Castle office. Next up on The Arts Castle’s summer exhibit calendar is the Equine Jubilee, which is scheduled to be on display from Aug. 14 through Oct. 14. Henning said it’s an homage to The Little Brown Jug. Later this year is the Castle Arts Affair, scheduled for Nov. 2-18. Meanwhile, at Gallery 22 on East Winter Street, Romancing Illusions: The Art of Mac Worthington continues its six-week run that started on July 7. That exhibit will be on display until Aug. 19. Gallery 22 is open from 6 to 8:30 p.m. on Friday and Saturday. “Mac is a metal artist. He’s fantastic,” Henning said. For information about The Arts Castle, visit artscastle.org or call 740-369-2787. The Arts Castle is located at 190 W. Winter St. in Delaware. Gallery 22 is located at 22 E. Winter St. Visit www.gallery22.net for information. Reach Carter at 740-413-0900 or on Twitter @DelOhioEditor.